The market has been anxiously awaiting the European Central Bank policy decision, and at 12:30 GMT today, ECB chief Mario Draghi is expected to announce the framework for a new bond-buying program to help bring down the borrowing costs of Spain and Italy. Investors are looking for Draghi to back up his promise of July 26 to do "whatever it takes" to preserve the euro. European markets and U.S. futures were rallying on Wednesday night in anticipation, and this could be a make-or-break moment for the markets. Gilles Moec, senior European economist at Deutsche Bank stated, "Expectations are extremely high. If the ECB does not deliver, we will get into another bad patch." ECB debt purchases would succeed the bank's Securities Markets Programme that has been dormant since March -- which, not coincidentally, is when the S&P 500 (SPX) began struggling. I believe it was the liquidity overflow of the ECB's LTRO, not the Fed's Operation Twist, which was the driving force behind the rally that lasted from December 2011 to early April 2012. The time-lines match perfectly. Central bank liquidity operations have a huge impact on equities, since equities prices are driven solely by liquidity ("excess" liquidity drives up asset prices through inflation). Thus, until the details are revealed, the pending ECB policy decisions are currently an x-factor in my projections and analysis. 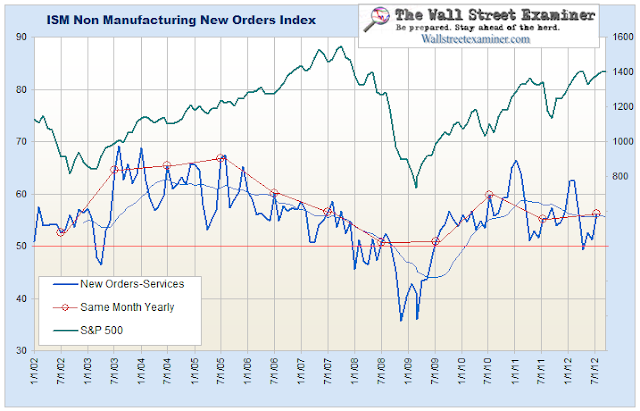 The next two charts are courtesy of my friend Lee Adler at the Wall Street Examiner, and portray the ISM Manufacturing Index (which represents goods) and the ISM Non-Manufacturing New Orders Index (which represents services). Non-Manufacturing numbers are due to be released today. 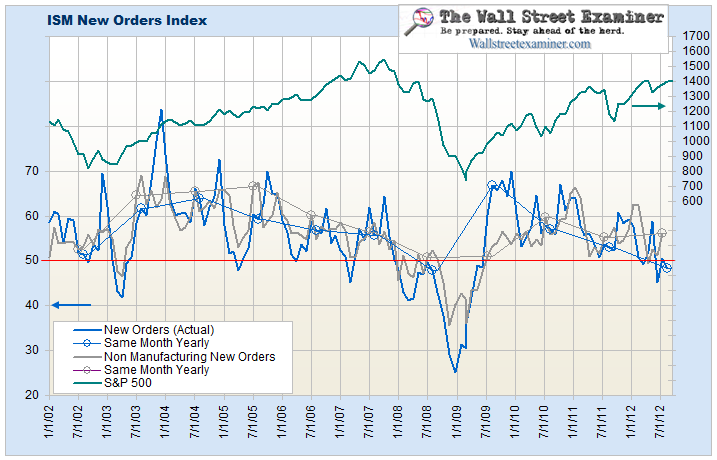 Levels below 50 on either index tend to indicate economic recession, and the Manufacturing Index is already there. 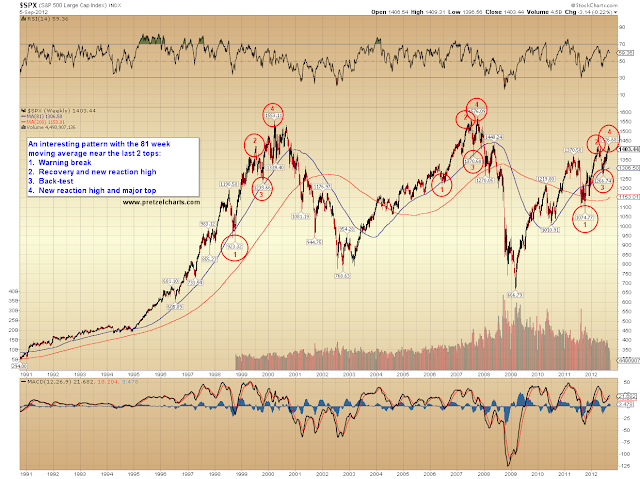 In June the current slide reached 45.2, the same level the index had reached in March 2007, 7 months before that bull market ended. With the number still below 50, the rally's days are probably numbered, although it's impossible to tell from this data just how long the lead time might be this time. Federal withholding taxes were weak in August through last week, so there's some reason to believe that business has continued to weaken. High gas and food prices and weakening exports are apparently having an impact. The manufacturing sector represents about 11% of the economy. The services sector data representing the bulk of the US economy, normally released a few days after the manufacturing data, typically lags the manufacturing index by a month or two. 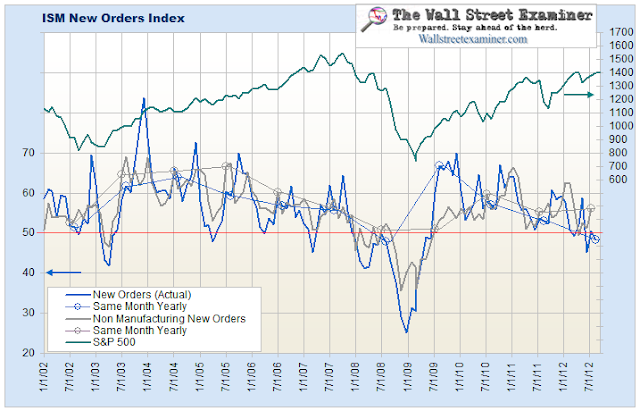 The ISM manufacturing new orders index therefore appears to be a good leading economic indicator but in terms of its bigger year to year trends, it is not very useful as a stock market indicator. Below is the ISM Non Manufacturing (Services) New Orders Index, not seasonally adjusted through July. The August index will be released on Thursday, September 6. If it does not follow the manufacturing index, and stays above 50, then the stock market uptrend can probably hang on for a while longer. 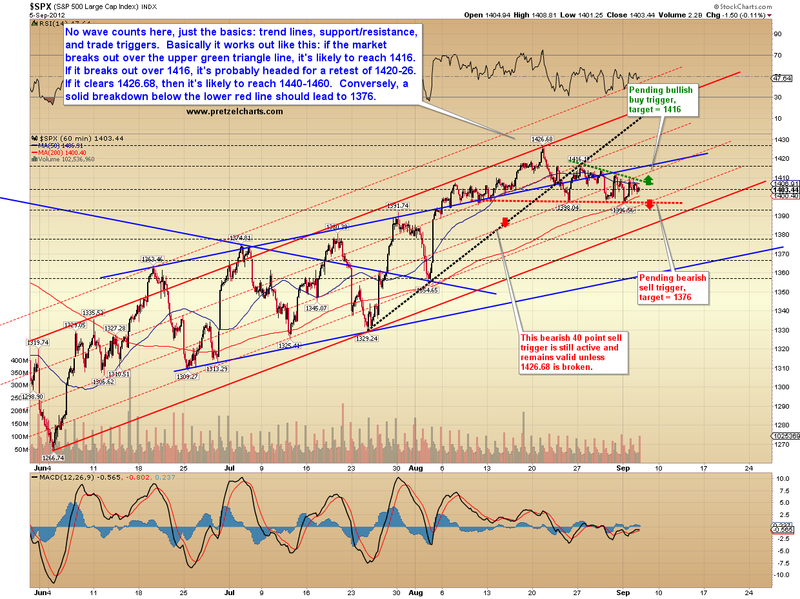 If it drops below 50, then there's reason to believe that the rally will soon end. So, the U.S. economy isn't particularly rosy (as if I needed to tell you this), but today's number will be important for fleshing out the picture. 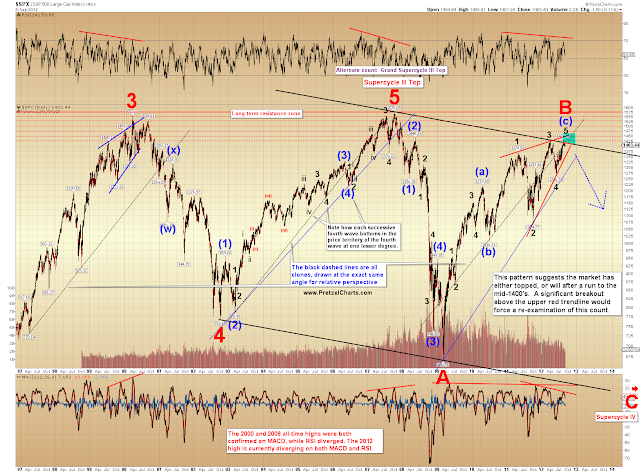 The first chart I'd like to share is my interpretation of the long-term SPX pattern. 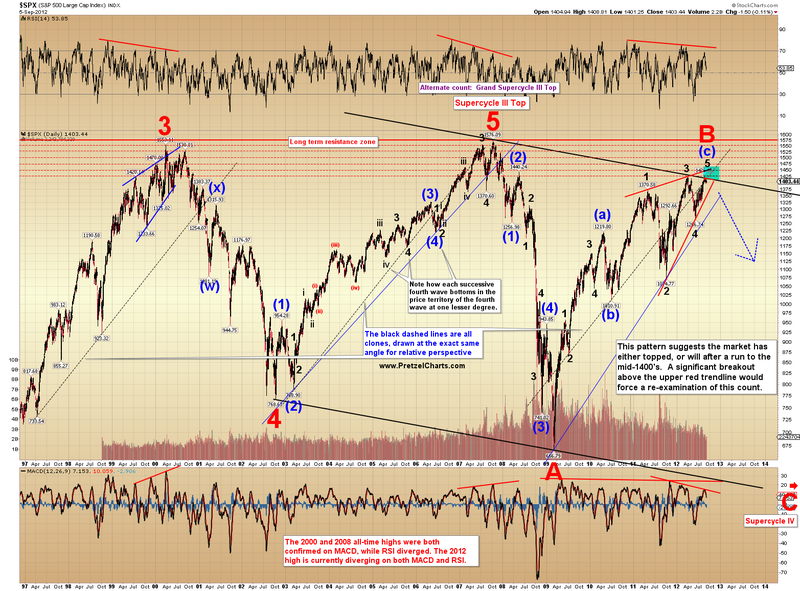 The main question in my mind is whether the top is in, or whether there's a run slightly higher still in the cards. 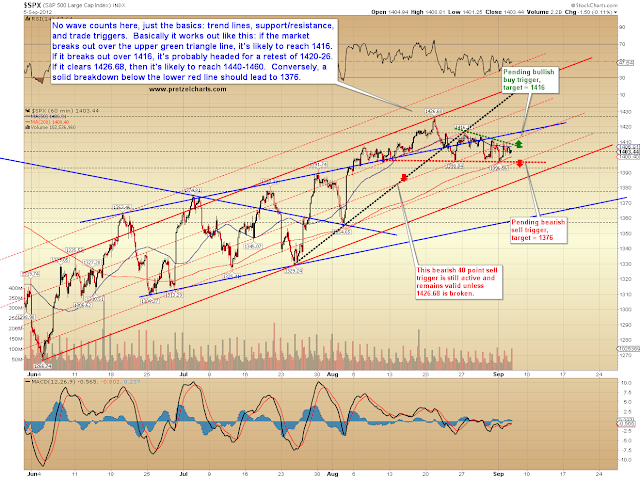 My preferred view since the anticipated swing high at 1426 has been "the top is in," however, since 1391 has not yet been crossed heading downwards, I'm still unable to add confidence to that view. In either case, this is expected to be a major top under formation and, in my mind, only a material breakout through the upper red trendline would challenge that view. The next chart depicts an interesting relationship and historical pattern I've observed between the SPX price movement and its 81-week moving average. The chart explains the details. 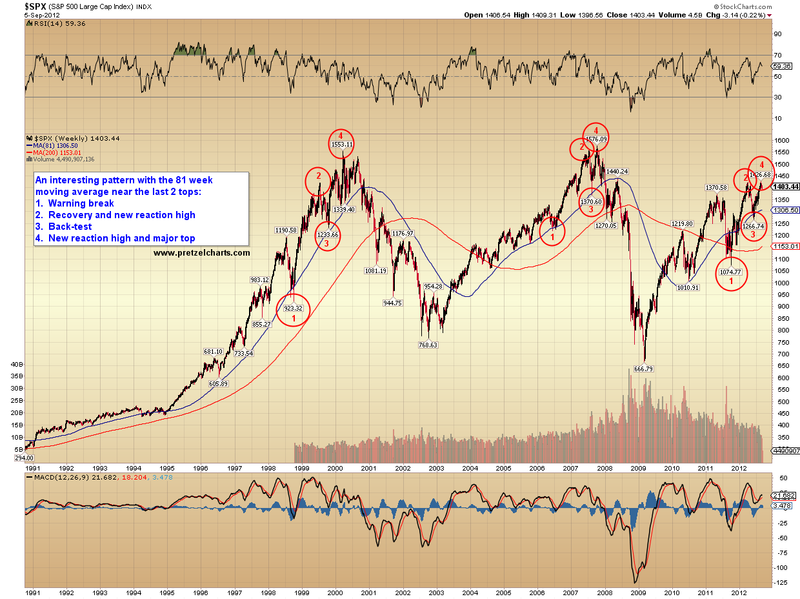 The charts above represent the long-term outlook. Changing time frames rather dramatically, the chart below discusses some short-term levels to watch, and the higher-probability short-term outcomes if each key level is broken. 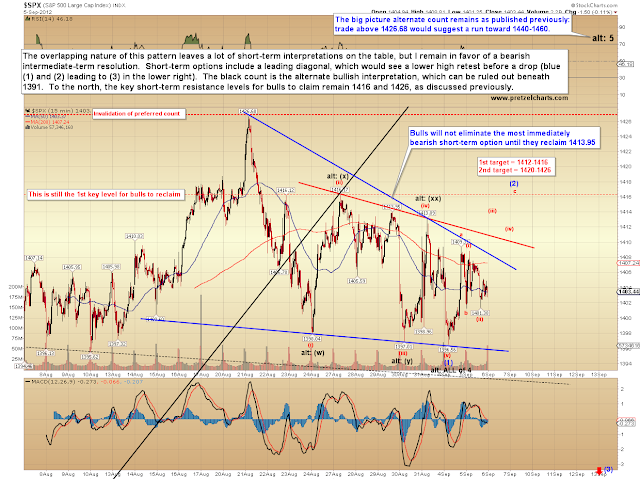 The next chart represents a best-guess at the short-term wave count (as discussed yesterday), but this pattern is very difficult to interpret, and I wouldn't be surprised to see the market do something unexpected here -- especially given the anticipation and pressure surrounding the ECB announcement. Until the bulls reclaim 1413.95, there is the potential of an extremely bearish short-term outcome, and trade beneath 1391 is likely to precipitate an acceleration lower. There's a lot going on today, and the ECB has the potential to disappoint the market. I think the best possible outcome for bulls really isn't that wonderful: the ECB might be able to kick the can further down the road and delay the inevitable for a few more months. I seriously doubt they're actually going to solve any of Europe's long-term problems, however the new policy does have the potential to generate a temporary result in equities and will thus need to be watched closely. The U.S. economy appears to be on the brink again, and today's ISM numbers should be revealing. It does not seem coincidental that the fundamentals are suggesting a major market top is forming, while the price charts (in my view) are also suggesting the same thing. The x-factor seems to be the question of how much longer the central banks can keep pulling rabbits out of their hats... as of right now, many indicators are suggesting that they're running out of rabbits. Trade safe.